In a series of atmospheric tableaux, the distinguished Canadian author/illustrator portrays mementos and images from visits to each province and territory over his long career. U.S. and perhaps even Canadian children are going to need the descriptive notes he tacks on at the end, because without labels, the folk dolls, hand-carved animals, and other small items on display have no context beyond an occasional place name. 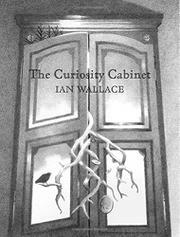 (This lack really comes home to roost with the Yukon spread’s ordinary-looking tobacco tin—which contains, Wallace assures us, the “infamous ingredient” in a “sourtoe cocktail.”) Signaling that the “cabinet” is at least partly imaginary, shelves turn into landscapes or assemblages of images as the survey progresses, and Wallace caps his notes with a self-portrait that makes the notion explicit. Finally, though the results are technically masterful, pencil may not have been the best choice for the art, as a silhouette representing the author’s well-traveled red sneakers and a red Chinese money envelope are both monochrome, and he makes much of a fan letter decorated with a rainbow that, here, is just a set of barely distinguishable gray stripes.